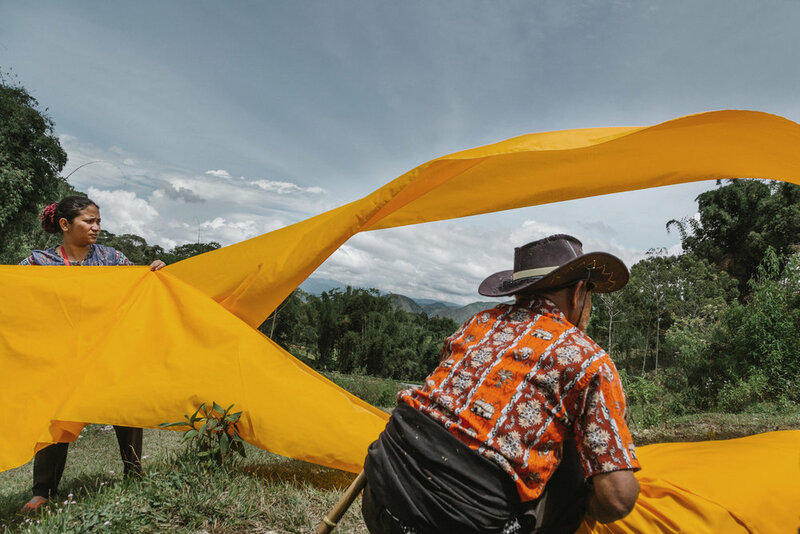 In August 2016 I packed my bag and stayed in a southern part of Sulawesi, a highland known as the most elaborate funeral ceremony in the world where death is not an end for indigenous people in Toraja, South Sulawesi, Indonesia. The majority of Toraja are mostly Christian Protestant, and some are Catholic - introduced by the Dutch colonial missionaries. Even now some of them are still practising the ancient animism beliefs - Aluk To Dolo (”way of the ancestors”) as the part of their Adat - or local customs. The majority of Toraja are mostly Christian Protestant, and some are Catholic - introduced by the Dutch colonial missionaries. Even now some of them are still practising the ancient animism beliefs - Aluk To Dolo (”way of the ancestors”) as the part of their Adat - or local customs. When relatives died, the corpse is kept in a room inside a Tongkonan - a traditional house, living together with the family and treated as a sick person ( Toma Kula ). Foods are given regularly because it is believed the spirit remains near the body and needs care. 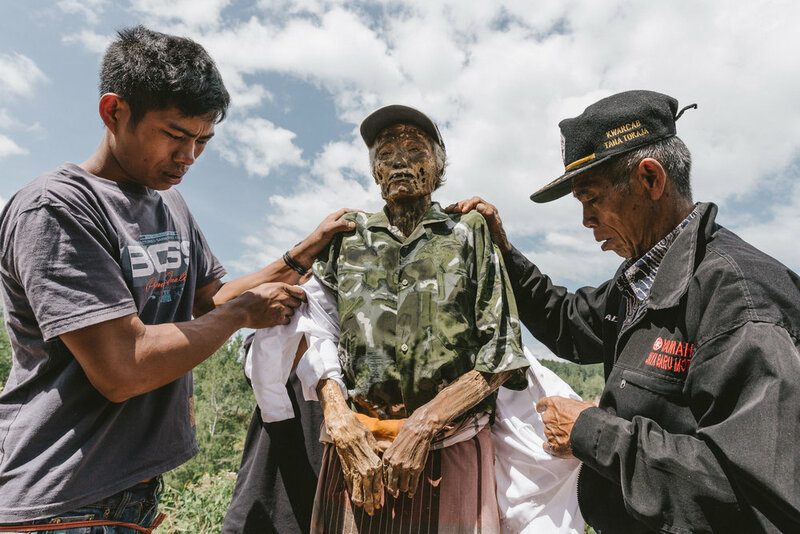 It could take several months, years or decades after one has died until the Rambu Solo, a funeral ceremony is performed. A person would have officially died from a ”sick person” is marked with the first water buffalo sacrificed during Rambu Solo ceremony. The more buffaloes to be sacrificed, the easier the dead's soul to find a way to Puya - heaven. One buffalo can cost up to US$50,000 depending on the skin patterns, the colour of its eyes, the horns shape and is sold at Bolu Livestock Market in Rantepao city. Twenty-four is the suggested amount of water buffalo to be sacrificed for the middle caste funeral. It explains why the corpse is being kept for so long in a family house because a rambu solo ceremony can last up to five days and the cost of a funeral is between US$30,000 up to US$400,000 for the higher castes. 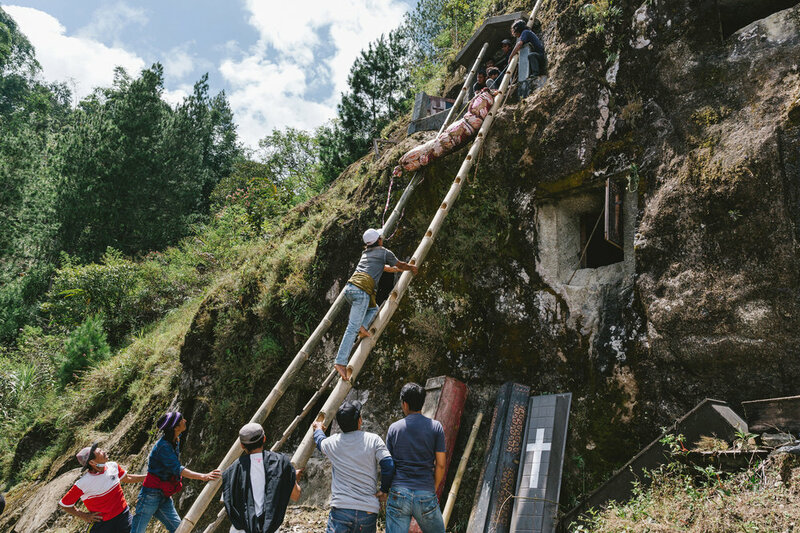 After the deceased buried in a stone grave, once every two or three years after the harvest season in August, the family will gather for Ma’nene - a ritual when the dead will be taken out of the caskets to be cleaned and given fresh clothes and a sunbath, as the way of respect for the ancestors. August has come to an end, all the graves are cleaned with a fixed casket. The families closed back the tombs and reopened for the next Ma'nene in two or three years. 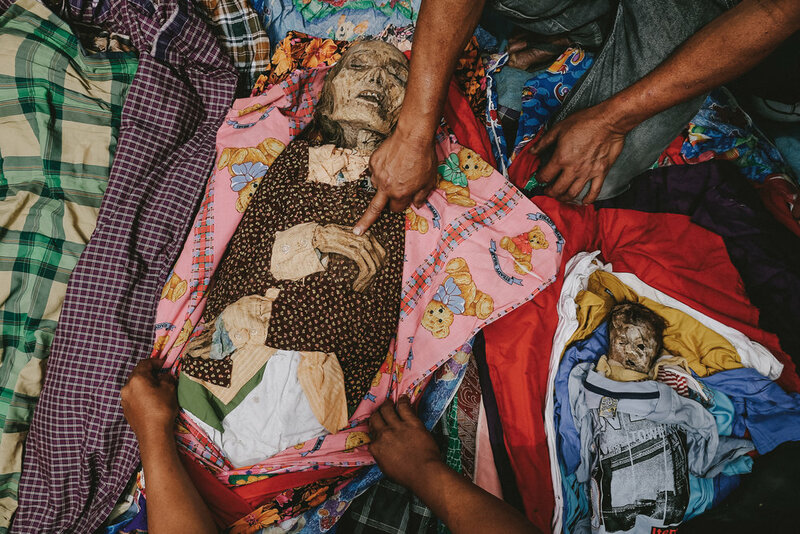 Ma'nene ritual is a celebration of the love beyond the death inspired by a story of Pong Rumasek, a hunter who found a corpse and wrapped it with clothes and gave a proper burial to the body. It is believed Pong Rumasek was receiving good luck and blessings since then. 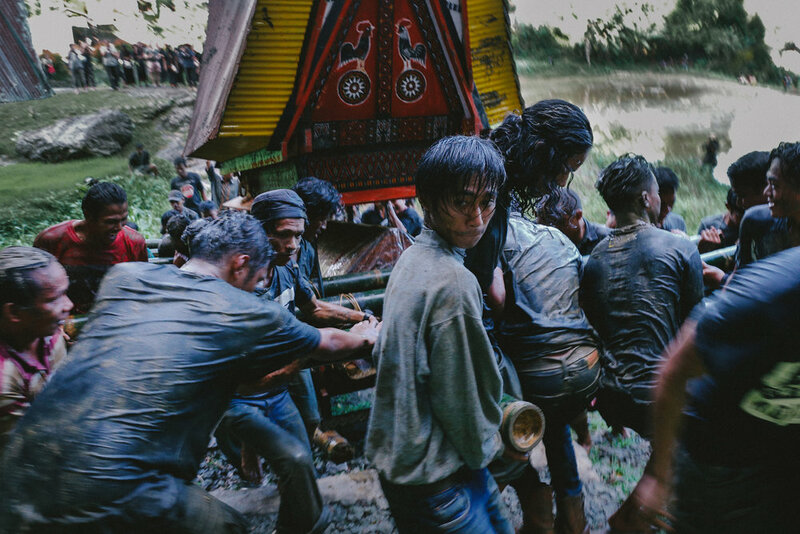 How fascinating it is to know that in a place like Toraja, a funeral ceremony is far more important than a wedding ceremony, and how the death actually unites the living ones.